NetWalk is a comprehensive network monitoring tool which can be used as network intrusion detection system (NIDS) for business networking. It captures packets over the network and decodes packets to extreme details. It takes advantages of Wireshark and WinpCap and achieves better performance in packet sniffing and network analysis. Modern corporations need AthTek NetWalk, because it can greatly enhance the network security. Network engineers need AthTek NetWalk, because it can help them a lot in network monitoring and packet sniffing. Small business owners need AthTek NetWalk, because it can generate a rich traffic statistics report for their online business. If you are pressured to the network mangement problems, such as network monitoring, packet sniffing, traffic analysis and troubleshooting. Especially for the enterprise network, it contains huge business data which should be protected seriously. We highly recommend you to try AthTek NetWalk. With it, all these problems will be solved in several clicks. Skilled network engineers will like AthTek NetWalk. 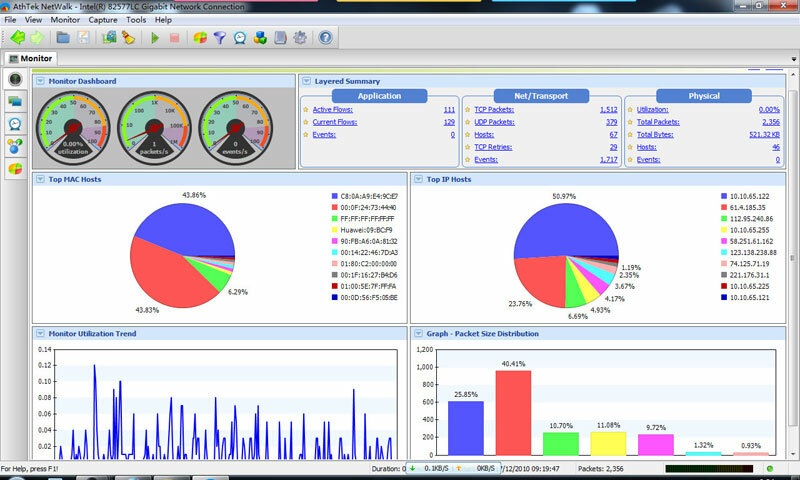 Because it is an advance network monitoring tool for packet sniffing and decoding. It perfectly support IPv6 which will be the modern type for future network. The built-in packet filter will trigger alerts when the network is under attack. In one word, AthTek NetWalk is the best choice for network monitoring and packet sniffing. You don?t need to spend a lot of money on network monitoring service or popular packet sniffers, AthTek NetWalk can help you to achieve better performance with affordable price. Power Spy For office is a well designed and all-in-one spy software for office use. Monitor how your computer has been used while you are away. Developer provides powerful and efficient monitoring web site software that keeps track of incoming, inbound and outgoing weblinks over internet and immediately informs publisher if any inward link is removed or found broken on advertisers web pages. Efficient server monitoring software empowers user to consistently tracking downtime, response time and uptime status of web site over internet and generates websites error logs reports in easy to understand HTML, TXT or graphical file formats. USB data preserve application is logical monitoring tool which provides details of USB device activities of employees and other users. Blocking USB utility facilitates to create a log file for maintaining the actions of USB storage device. This site does not contain serial number, crack, keygen NetWalk serial number : serial number is the simplest type of crack. A serial number(cdkey,product key,etc) is register the program as you may already know. a crack or keygen may contain harmful software. If you cannot find the exact version you want, just give it a try. for more information read .nfo/.txt/.diz file include in zipped file.